It was a very damp night at Carnforth as the top two teams looked to strengthen their places at the summit. Top team Wray took on Galgate in what looked to be a tough fixture for our champions elect. Unfortunately for Galgate, they were a player short. This made it very difficult and as well as they played, there were just too many holes in their defence. Credit to Galgate, who managed to score 3, which is more than some teams have scored when playing Wray with 5 men!! 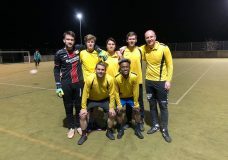 Crown Lane were looking to kick start their season again, after a couple of disappointing results in recent weeks, against a Carnforth team that were full of confidence after scoring 13 the previous week. Crown Lane welcomed Luke Parkinson back after a few weeks out injured and his pace and close control added to an already excellent attack put Carnforth on the back foot right from the off. Crown Lane found themselves 4 – 0 up at halftime and only some last ditch blocks and tackles from Carnforth and some great saves from Thomas Salmon in goal, kept the score down. Carnforth slowly worked their way into the game more and more and created a few chances, but lacked a finishing touch, until late in the game, when they finally scored. Crown Lane eventually ran out 9 – 1 winners and it was their playmaker, Sam Hogarth, who spoke to us all at 9pm. Sam talked about King Solomon who chased after all that the world had to offer. He became very rich, had many possessions, had many wives, had exceedingly great wisdom and was the greatest man alive at the time and yet at the end of his life he said that all these things were meaningless. Sam reminded us of the words of Jesus, that Sid shared with us last week, “I am the bread of life; whoever comes to Me shall not hunger, and whoever believes in Me shall never thirst.” Jesus wasn’t talking about physical food, but spiritual. Whoever turns away from their own desires and turns to Jesus and asks Him for forgiveness and lets Him live through them, will know this spiritual hunger, satisfied and this spiritual thirst, quenched. In the late games Young Guns were up against Capernwray Students and Capernwray Staff were playing Chipping. Young Guns have been playing really well recently and had far too much firepower for a Student team, who desperately needed a good result, to keep in touch at the bottom of the table. Young Guns were very well organised by Matt Dawson in defence and despite the students working really hard throughout the game, Young Guns kept breaking through and were comfortable winners. In the other game it was Chipping who were much the better team early on and it took the Staff team nearly 10 minutes before they really threatened the Chipping goal, by which time they were already 2 – 0 down. Josh Hardman in particular took the game to the Staff and linked up many of the Chipping attacks. 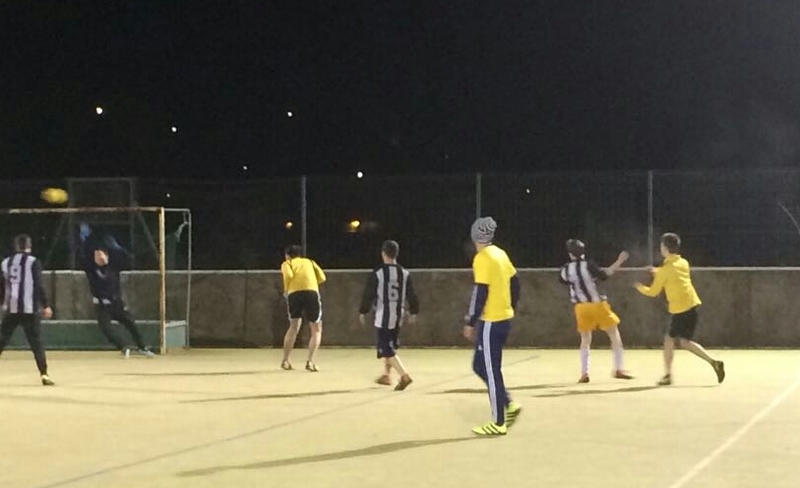 Staff did manage to score towards the end of the half, but trailed 3 – 1 at half time. Staff were given a team talk from their manager Steven at half time and came out a different team, playing with more confidence and pressing Chipping higher up the pitch. This reaped its rewards and they soon levelled the game. Chipping after being so comfortable, struggled to raise their tempo, but as the second half went on, they retook the lead only for Staff to level near the end and take a very valuable point in a game they looked like loosing for so long.